I like white chocolate but I wouldn't normally choose to eat it. But if you roast it until it caramelises and add a touch of salt? I can't leave it alone. Though I have a faint memory of reading David Lebovitz's post about caramelised white chocolate in 2009, I didn't try making it until the day Food 52 published an article about it. It felt like the first time I tried brown butter - a whole new set of possibilites opened up and I couldn't stop thinking about it. I have to admit that I still haven't tried it with the original Valrhona Ivoire. I didn't get around to ordering any before I left England last week and I haven't been able to get my hands on any here in Switzerland. However, I have had great success with Green & Black's White (twice) and Lindt Blanc. I've also tried a bar of Cailler Blanc Vanille but it quickly seized. I tried combining it with a bit of oil and blending it (as advised on Food 52) but it was still gritty and tasted oily. After buying some Felchlin couverture from a local bakery, I was very surprised when it seized instead of melting. Instead of trying to blend it, I left it in the oven until it reached a similar caramel colour. The tiny nuggets of chocolate tasted just as good and I think if you melted them down with a touch of cream, they might liquify. After a few spoonfuls of the caramelised chocolate, I decided that I needed to make éclairs. Choux pastry and I have history. Three years ago, after I started building croquembouche shaped like presents with chocolate ribbons, I became obsessed with choux pastry. I spent hours filling out spreadsheets with dozens of recipes, comparing ratios, temperatures and methods. Then it turned up at Le Cordon Bleu. Éclairs were one of our three exam dishes in my first term. Though I'd been warned about having a favourite, I thought that I had a much better chance of a good mark with one of them. I was convinced that I would pick the right slip out of the bowl of folded papers as I stepped into the exam room. But I didn't - I picked the éclairs. My focus blurred and for the first time in my life, I didn't rise to an exam. I tried to reason with myself that it couldn't possibly be harder than finals but once it had started to get messy and out of sync, I couldn't claw it back. Looking around, I compared my work to my classmates even though I knew it wouldn't help. Somehow I managed to cut myself on a plastic d-scraper and had to go out to patch it up. Struggling to breathe, I moved around in slow motion, time running out despite every minute feeling like an eternity. I screwed up the elements I was best at and left the room feeling sick. The feeling lingered on, even though I passed and my other marks pulled me up to a good grade overall. I was embarrassed that I had let it get to me, that I'd cracked instead of rising to the occasion. To be honest, I still am. The experience coupled with the type of éclairs we made (filled with cloying coffee pastry cream, topped with super-sweet fondant) clouded my love of choux pastry. I stopped making it, even though fresh éclairs filled with softly whipped cream and topped with melted chocolate are one of life's great pleasures. In general, my experience at Cordon Bleu pushed me away from neat pâtisserie towards the simple, the not-so-sweet, the seasonal and the slightly messy. I like the odd drip of golden chocolate sneaking down the side, streaking the escaping cream. I can't think of a better way to use the caramelised white chocolate and - while I worry about hyperbole - they're one of the tastiest things I've ever made. Though the general consensus seems to be that you should make the chocolate in big batches of 350 - 450g, I like smaller batches so I can try different things out. The recipe below makes just enough to cover the six éclairs with a bit extra for tasting - you could easily make more and use it for other things. When I was taking these photos, I was making a double batch of the choux, so the amounts you see are a bit bigger than you'll get from the recipe below. I weigh the liquids for the pastry as they're small amounts and need to be accurate. If you don't often use a piping bag or want some tips, I recommend this excellent tutorial on BraveTart. I use disposable bags like these. Finally, I really recommend tasting and smelling the chocolate as it roasts and sensing how it develops each time you take it out. The colour is a good guide but it's far more fun to eat it. Do try it before and after the salt, too - the difference is quite spectacular. Preheat the oven to 120C/250F for the chocolate. Break up the chocolate and place it in a small baking tray. Put into the oven. 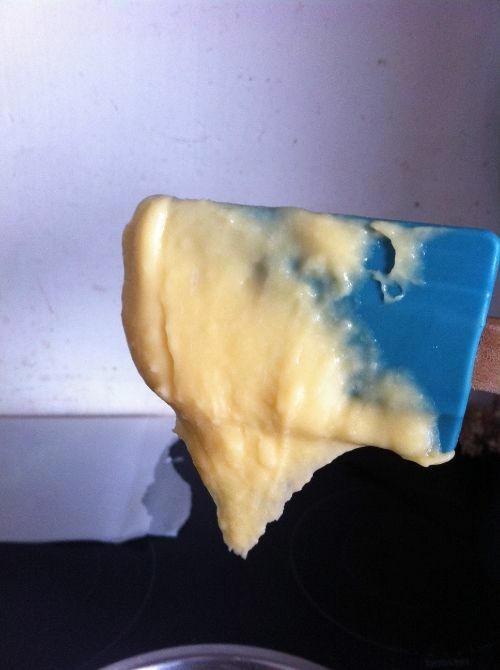 After five minutes, take it out and stir with a spatula - it may be stiff at first but should smooth out. Repeat every five minutes until it is a lovely deep caramel brown (mine took about 40-50 minutes*). Stir in the salt. Scrape into a small bowl or jar and leave to cool. This should keep for months - it will cloud once it cools but don't worry. Preheat the oven to 200C/390F for the choux. Prepare a piping bag with a plain tip (not sure of the number but mine has a diameter of 1.3cm), push the bag into the tip and sit upright in a tall glass. Grease a baking tray. Cut the butter into cubes and add it to a small saucepan (mine is 15cm) with the water, milk and salt. Sieve the flour onto a big sheet of baking parchment, fold in two to make a shoot and put near the hob. Put the saucepan over a low heat until the butter melts. Turn up to medium-high and bring just to the boil - when it's steaming and you see the first bubbles in the middle, take off the heat and immediately shoot the flour in off the baking parchment and stir with a wooden spoon until it comes together. Put back onto the heat and stir for 1-2 minutes - you should have a stiff ball of paste that sizzles and leaves the sides of the pan clean. Tip into a mixing bowl and squish up the sides to help it cool. Leave to cool for a few minutes until it's warm - not hot - to the touch. While it cools, beat the egg lightly together. Add a dribble of egg to the bowl and beat into the paste (it goes slimy and looks like it won't incorporate but if you keep going it will). Keep adding small amounts of egg until it is all incorporated - around 6 inclusions. If you scoop up the mixture and turn the spoon to the side it should hesitate, then fall off in thick ribbons, leaving a hanging tail. Scrape into the piping bag and seal. Pipe 11-12cm lines onto the tray, flicking back onto the éclair to finish, leaving a few cm in between. There should be enough for 7, which gives you one spare in case of accident (or for a few profiteroles...). Add a dash of milk to the eggy bowl, then dip a pastry brush into it and lightly brush in opposite direction to your piping, smoothing down the flick. Bake for 20 minutes at 200C without opening the door, then turn down to 180C, use a wooden spoon to jar the oven door open and bake for 10 minutes. They should be deep golden brown all over and crispy. Cool on a wire rack. (You can store them for a day in a sealed tin, but they're best fresh). Place the chocolate over a pan of barely simmering water and melt. Leave to cool and thicken slightly. Pour the cream into a mixing bowl and add the vanilla. Whip until you have soft peaks (or whip in a stand mixer but be careful not to overwhip). Slice the éclairs lengthways with a serrated knife. Spoon the whipped cream into the bottom half then place the other half on top. Use a blunt knife/small palette knife to spread the chocolate on top. Serve quickly - they're best within an hour. You can keep leftovers for 24 hours in the fridge, but they're not as good. * Several commenters have told me that theirs took longer to caramelise - it seems to depend on the oven and the brand of chocolate. If you get fed up waiting, it seems you can increase the oven temperature a little and it should start to turn. I haven't tried it on a higher temperature myself, however. Wow, these look gorgeous. I actually had éclairs on my 'to bake' list for next week...choux pastry and I have been parted for too long. I enjoyed making caramelised white chocolate so much, it seems to be an incredibly versatile ingredient as well. So glad you're back in the éclair making game! Oh, wow, I had never even considered that caramelized white chocolate was a thing! I will definitely be trying that soon. These look wonderful! Wow, not only does your caramelised chocolate look incredible, but I love that this is a small batch recipe - I will definitely be trying these soon! Seriously, if you have any caramelised white choc left, try it on your éclairs. Dark chocolate x10000000. It's so good, do try it! It does take a bit of time but the reward is worth it - like so many things that require a bit of patience! Oh Emma, why do you do this to me?! You do realise that my bookmarks are rapidly filling up wit your recipes I don't have the equipment to do here that I am going to have to make and gorge from when I fly back to England this Summer?! I really hope you try it, I'm head over heels for this recipe. I like small batches, especially for things that don't keep - I hate wasting things and I don't often have a crowd to feed. This is my favourite post of yours. It's simply stunning, you capture character and calm simultaneously in your photographs and I find your words very humble. I'm invited to a dinner on Saturday and have been asked to bring dessert, can I justify eclairs for dessert? Can we turn tea treats into late night treats? That would be awesome! And yeah, it is what is stressing me out at the moment, but at first it was the American ingredients - however, I am now proud to say I have mastered the art of switching recipes from England to America and back again! Il est une heure vingt du matin, j'suis dans mon bain et maintenant, j'ai FAIM! I first read about it when Valrhona released their Dulcey chocolate, but then I learnt that my chocolate school have been teaching how to make it for a few years. The teacher at my school (Chokladskolan in Nora) told us that she read it in a French cooking blog back in 2009 (I think). I think this has been done to milk chocolate for some time as well, there's a few brands where the milk chocolate tastes very "caramel-y" and Marabou (big Swedish brand) claims that they are using some sort of secret, advanced process when they're making their milk chocolate to produce the caramel flavour associated with the chocolate (sounds a lot like the things Valrhona said about their Dulcey chocolate about it being secret and no one else does it etc), this process might very well be the same, just putting the chocolate in the oven. Or similar. I don't really use recipes or weigh savoury food so I can't say I've ever tried cups in that realm. I just find them so frustrating with baking - flour alone makes me want to tear my hair out! I wonder if she read about it on David's blog then (being a French cooking blog that posted it in 2009). He'd been on a course at Valrhona, which is how he knew. I've actually been playing with milk chocolate for the past few weeks - I wondered who else was trying it. I'll post my findings soon! I know - it seems like it should be so complicated! I do hope you try it - it's a really fun way to spend an hour or so, tasting and stirring and watching it change. Thank you - I'm glad you like them. Hehe! You read me well. I saw the brownies - did the caramelised flavour stay prominent? I was worried that if I put it with anything strong flavoured in itself that it'd hide behind it. & do try it with eclairs - so, so good. I hope you do, they're so delicious. I've tried this choux recipe five times in the past two weeks (my mum has tried it too) and I've been really pleased with how consistent and reliable it is. Not going to lie, I did have a hallelujah moment last night when I was trying the meatloaf from the Smitten Kitchen cookbook (the American edition mind you) and I found all the cup measurements had grams in brackets next to them! I've never heard of caramelised white chocolate, but from the way you've described it, quite happy to go off and make a bowl full and skip the eclairs! Ah, right. That's interesting to hear! Maybe Valrhona were first then. Its structure was applied as style by quite a few musicians. and design and style. Utilizing a lip adhere which is a lighter in weight shade will make tooth feel yellow. I'm going to have to try that caramelised white chocolate soon aren't I? These eclairs look heavenly. Caramelized white chocolate is one of those underused gems in pastry, these eclairs do look heavenly! Hehe, a bowl of it sounds like a great idea. I tried pouring it over vanilla ice cream too. It's brilliant isn't it, I'm surprised it's not used more. Glad you like them. What a wonderful topping for eclairs. Would be perfect with profiteroles and chouquettes too. With the seal of approval and encouragement from both you and Little Loaf, I am just going to have to try caramelizing white chocolate! Quick question: it looks like you used a glass / pryrex baking dish rather than a metal tin. Would you recommend this? Thank you. I've been super curious about this method since I saw it on Food52 as well! What a wonderful application by using it as a topping for eclairs. I'm dying to try pouring it over a pile of profiteroles. I hope you try it! I've tried it with a glass dish and a metal dish - both work. The metal seems to speed things up a little but the glass is slightly easier to scrape down. I hope you try it, Madison - it's a bit like magic. A little goes a long way, too. Hi, I just nominated you for the Beautiful Blogger Award!!! If you like take a look at my blog. That's sweet of you, thank you. That's totally natural - the chocolate loses its temper (technical term, not emotional!) when you heat it like this, so it goes slightly cloudy and has little spots. As you say, it takes a day or so to develop, so it shouldn't be a problem on the eclairs as they don't last that long. It will melt down and look totally fine again (until you cool and leave it). So pleased you made it though! Me again. Hooray! It finally worked. I whacked the oven up to 170 so I could bake the shortbread and lef the white choc in on a lower shelf. After 10 mins it had turned a lovely caramel colour and the flavour had altered substantially. I think next time I try the caramelisation I will use a slightly higher oven heat. I do have an oven thermometer and it was reading 120 so maybe it was the brand of white chocolate. So sorry it's taken me ages to reply, I thought I already had. The white does seem more likely to get grainy. So pleased it worked in the end. Different brands do seem to take slightly different times but I'm surprised it took that long. Thanks for letting me know! It's a great process, I hope you try it. Emma, i got myself to making the caramelized white chocolate this past weekend, but instead of roasting it for only 1 hour, i had to roast it for about 3 hours to get that right caramelised color. i followed the recipe, i really did6 i reread it ten times but still haven`t figured out why it took me so much longer than required. any suggestions? Hi Sasha - sorry to hear it took longer than expected. The time above is really a guideline - each brand of chocolate seems to behave a little differently. 3 hours does seem like a long time, though (you must have been very bored of stirring it!) - do you know if your oven runs a little cool? That might not have helped. You can also generally do it on a slightly higher oven temperature - I just wanted to be careful and that was the temperature recommended to me. I hope it was still absolutely delicious when you took it out? Hi Emma, I made these just last night. It's a pity I didn't think to read the comments first as my chocolate took two hours to caramelise. I did eventually think to increase my oven temp and it changed colour and flavour pretty quickly from there. I used green and blacks. The eclairs worked perfectly, I was so happy with the choux so thanks for that. I popped a few raspberries in too. Ill definitely make these again! So pleased to hear that you enjoyed the eclairs, Elly - I wish I could have had some. Love the idea of raspberries too. Sorry to hear the chocolate took longer - I'm surprised that the G&B took longer as I have tested that. I'll put a note into the recipe to make it clearer that the time is variable. That's interesting, I didn't know that. Thanks for the tip! Just had a quick google and it says Cadbury's Caramilk was a milk chocolate bar with a soft caramel centre? Perhaps it had another name? I have to try these! I've never heard of caramel white chocolate and I'm intrigued to give it a go. I'm also a bit partial to chocolate eclairs and, like you, haven't made choux pastry since cook school. I was doing a savoury choux recipe for part of my final assessment and whilst my perfect choux buns were cooling in the oven I 'accidentally' turned the wrong oven back on. Burnt is an understatement! These look delicious! Most definitely going to be swapping the usual dark choc for caramelised white choc on my next batch of profiteroles! THIS! Oh my, it looks delicious!